gulp. but- with this new yummy sauce i’ve concocted, i don’t think it’s going to be such a challenge after all. it’s packed with fresh basil and healthy fats from walnuts, flax seeds, and olive oil. plus the sun dried tomatoes give it a little tartness. first get your pasta cooking. i used soba noodles, but i imagine spaghetti, fettucini or linguine would work well too. next, toast your walnuts. i did this in the oven, but you could do it on the stove as well. for the oven: lay your walnuts on a baking sheet, and bake for about 8 min at 350. for the stove: on medium heat, toast walnuts in a pan for 3-5 min. in a food processor, toss in the walnuts, washed basil leaves, flax, and sundried tomatoes (if you have time to soak these before hand, they soften a bit. i soaked them in warm water for just 5 minutes because i was ravenous, and it turned out fine). run the motor, and drizzle in the olive oil and water. add in the salt and nutritional yeast (as well as cayenne pepper if you want some kick) and taste. i added an extra tablespoon of hot water to thin out the sauce, but you may like it better thick. once pasta is cooked, pour in the sauce and mix well. add more nutritional yeast and salt if you want. great minds think alike ;) i also made a vegan lasagna last week but there was no adorable baby veg to munch on it unfortunately. ps, if i’m reading the lasagna post correctly you got married last month right? !! congrats! This pasta looks healthy and tasty. I love Pesto. Have to try it out. This looks delicious and easy/quick enough for even me to make! Yumm, as always!! 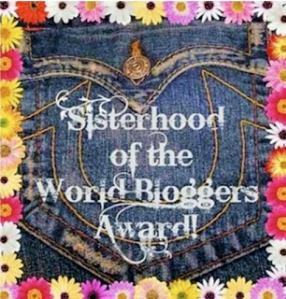 Just wanted to let you know I’ve loved getting to know your blog so I nominated you for a Liebster award! Happy Sunday! You’re welcome Sheila! I hope other people find your blog and recipes as enjoyable as I do!